A glamorous bedroom requires some very glamorous wall art. This piece by Kenneth Wingard is just the thing. 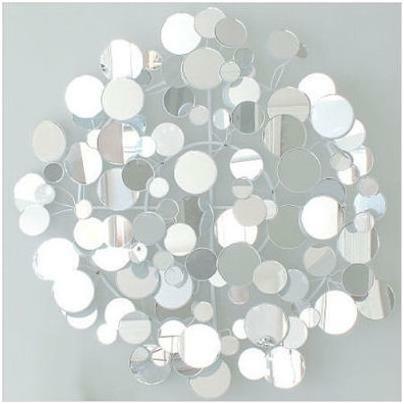 The Small Mirrored OP wall art piece is made from numerous glittering circular mirrors that are attached to moveable wires. You have the flexibility to move the pieces to either catch the light or the reflection of any passerbys. I think the success of Wingards determination to create a collection of contemporary and stylish home accessories is reflected in this piece. It manages to be stylish, glamorous, contemporary and even a little fun. Its circular shape will work with almost any wall space. The piece featured is 25” in diameter. It is also available in a larger version which is 52”H x 30” Wide. As a singular piece it will create an impact in your bedroom, or indeed room of your choice. This piece also lends itself to be used in multiples in large rooms or commercial spaces.